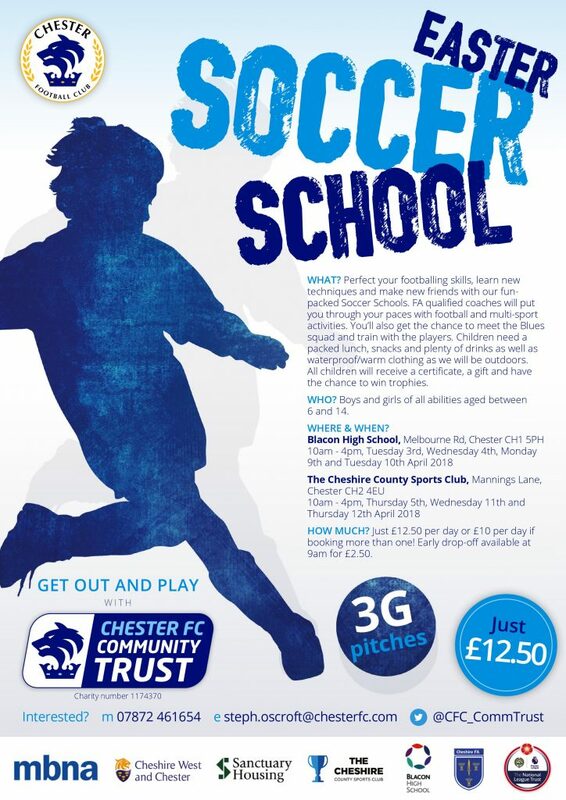 Bookings are being taken for the Chester FC Soccer Schools running through the Easter holidays. The popular football courses offer an action-packed programme of coaching, games, competitions and tournaments in a fun and safe environment. Both venues have fantastic 3G pitches and children will need a packed lunch, snacks, lots of drinks as well as suitable footwear, shin pads and appropriate clothing. There will be medals, certificate and the chance to win trophies for participants and opportunities to meet members of the Blues squad and train with the players. Each day runs from 10am until 4pm and costs £12.50 per day or £10 per day if booking multiple days. An optional early drop-off is available at 9am for £2.50. Online booking is available through Eventbrite (booking fee applies) at community.chesterfc.com/book-online. To book or for more information, please email community@chesterfc.com or contact Chester FC Community Trust on 07512 355396.